...and I may not have much time available for playing games (or for that matter sleeping) in the immediate future. But I don't mind too much. Manorites, meet our daughter Esther. Beautiful, Beautiful little girl! Congrats! I love little babies. Good luck with getting some sleep. Yes, I think games are going to go by the wayside for a while, but, sure worth it. Congratulations, Phlebas and Mrs. P., and welcome to the world, little Esther! She looks like she's thinking about what game she wants to play from your collection. I am jumping up and down with joy for you, Mr. and Mrs. Phlebas! Esther is just beautiful! Congratulations! Congrats, little Esther is just so beautiful! Congratulations, Phlebas! Esther, I would think, will be a lot more fun than any game...and much more complex. God Bless you all! OMG, so beautiful. Congrats, I love babies too. Yes I'm sure you will not get much sleep, you will definitely be very busy for quite a while. She's gorgeous and sleep is a much over-rated commodity! Congratulations to you both. Congratulations Mr and Mrs P - what a gorgeous addition Esther is to your family - Games? What games? Thanks everyone! 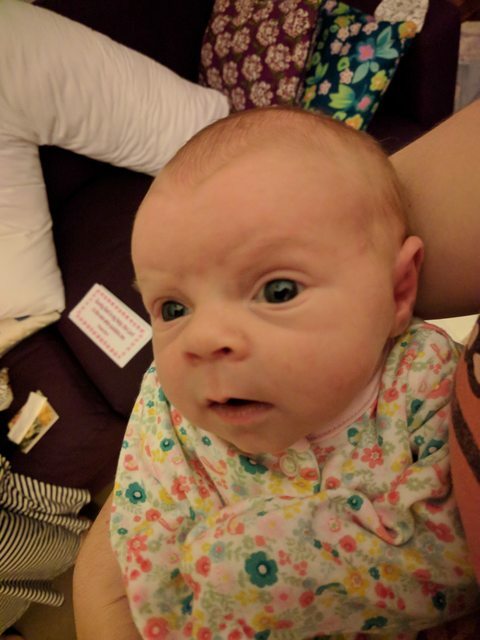 She is a month old today, still gorgeous and growing - currently she still fits into the flowery outfit in the photo but I fear not for much longer! As expected I haven't had any time for playing games in the last month. But I have spent quite a bit of time with dear Esther. I'll bet she has fun pulling on Daddy's beard, and it should be great for tickling. She has been having fun pulling the beard since day 1 - I was amazed at her grip! Ouch!! That must hurt! Have you seen the videos of the toddlers not recognising Dad when he shaves? Beware if you decide to do that in the future.